Hi guys! This is Arca. More than a year has passed since the show Gravity Falls ended. It was an amazing show that had a mystery element to it. 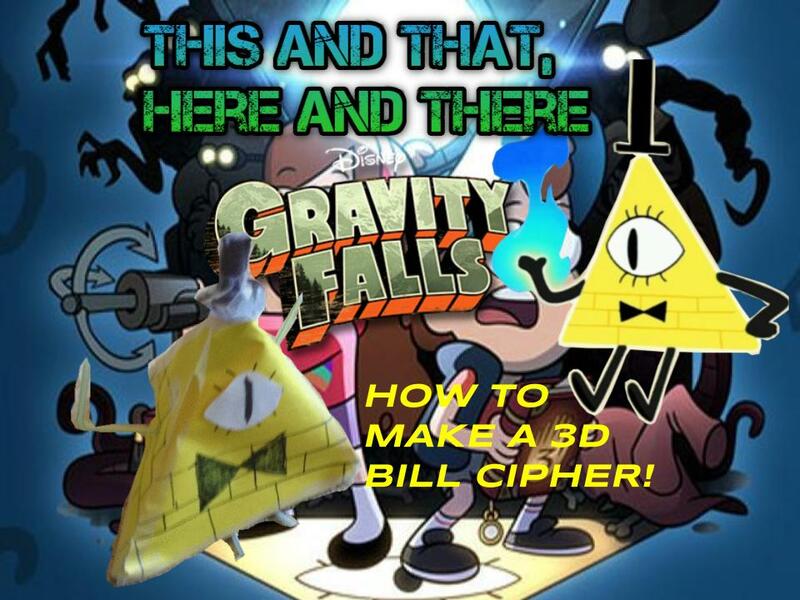 The main bad-guy was an Illuminati-shaped demon by the name of Bill Cipher. Today I will be providing a tutorial on how to make your own Bill Cipher using pencils, bendy straws, and paper. It will be a three dimensional pyramid. Step 1: Form a pyramid using the pencils and tape it all together, tying it with tape at the intersections. It may take a few tries to get the angles right. It will have a triangle base with three pencils coming out of each corner and meeting at a center point ahead. Step 2: Trace the bottom triangle onto a yellow sheet of paper. Don't worry if the sides aren't perfectly straight, there can be some extra space and just be sure to try to cut them straight. Also poke two holes in the triangle that are next to each other. you will later put straws through them. Cut the triangle out. Step 3: Tape on the triangle to the bottom face. Use tape at the edges on both sides to keep it stable. Poke two bendy straws through the holes you created previously. Bend them at the bottom. These will be his feet. Make them meet at the back pencil by taping them on. Step 4: Repeat steps 2 and 3 for one of the side faces. Poke a hole through the center for one of his arms. Draw several lines to represent bricks on the pyramid. The lines should stop halfway through. Tape on the side and make the straw's end taped onto a pencil on the opposite side. Step 5: Repeat step for the other side of the pyramid, making sure to bend the straws for his arms. Step 6: Wrap black paper around a pen cap and tape it to a circle-shaped part of black paper. Step 7: Tape the hat to the top corner. Step 8: Trace another triangle for his face and cut it out. Draw the bricks and his bow tie. Cut out an eye from a white sheet of paper. Glue or tape it on and draw eyelashes around it and a thin black pupil. Step 9: Tape the face onto the rest of it. You may have to cut off some of the top corner too make it fit. It ends up looking pretty cool! You can hang him up around your room or hide him around the house and have a contest to see who can find him. I hope you guys enjoyed this tutorial and followed along to create their own Bill Cipher. Stay tuned for more posts. I have just about reached 40 thousand views. My next special goal post will be at 50 thousand views. Be sure to view often to see new posts! Remember: Reality is an illusion, the universe is just a hologram, buy gold... BBBBYYYYYYEEEEE!!! Feel free to give positive feedback, reactions, or suggestions in the comments! All comments can be seen by me before they are public. I can choose to approve them or not. Personal Update and News: Arduino Robotics Camp, Nintendo GETS SUED, Nintendo World Championship 2017, and MORE!! Hello everyone! This is Arca! I have been away for a while and have not been able to post often when I was in Turkey. Now that I am back, I plan to make a post a day for the remainder of the summer. Consider this as a catch-up post, full of lots of news divided into different sections. Since I have left, some interesting things have happened regarding Nintendo, and I would like to share some of this news with you. Before I share this gaming news with you, I would like to share a personal update about the summer camp I went to last week. It was an Arduino robotics and programming camp on the campus of High Tech High School. they're featuring on the Kid's Menu at Subway? even featured in a recent TFK Extra. Telepods based on the show. Plus, they each have a special power! In this post, I will being a review of all three books in the "Masterminds" series by Gordon Korman. I finished the final book yesterday. Masterminds is an action-packed thriller mystery series with three books in it, all written by one of my favorite authors, Gordon Korman. The first book is called Masterminds, the second one is Masterminds: Criminal Destiny, and the third book that concludes the series is Masterminds: Payback. I am sorry for not always posting every day. When I get home from camp, I have piano, chlorine sickness (AKA swimming), and other stuff. I mostly post every 1-2 days, and will try to continue doing so. Last week, I made a book review of the "Masterminds" Series by Gordon Korman (you can see it here). I posted a link to this post and asked him a question on the official Gordon Korman reader's forum website (http://gordonkorman.com/forums/topic/masterminds/page/43) and he actually answered! This time, I read another one of his books, which a stand-alone novel not part of a series. It is called "Restart", and I will be reviewing it.